If you’re looking for a typical night out to the theater then Chris D’Arienzo’s Rock of Ages is not for you. 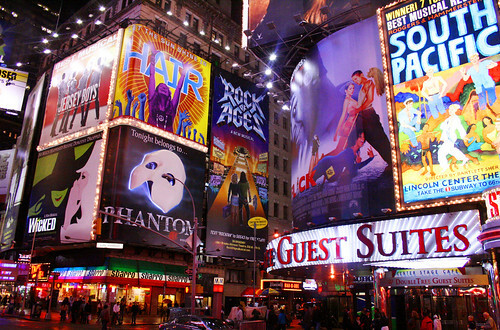 The musical isn’t your standard Broadway affair. The characters aren’t complex. There’s little emotional depth. If there were original songs then I missed that memo. What’s great about Rock of Ages is that it isn’t a Sondheim musical. It’s what it claims itself to be: an evening of poop jokes and White Snake songs. By the intermission, I wasn’t sure if I was either too young to appreciate the show (I was born in the 80’s) or just confused. The show’s first half contained too many mash-ups, making it hard to focus on the little plot that actually exists. It was as if the 1980’s exploded on stage into fast-paced bits of stereotypes and pop culture references. Anyone looking to reminisce about the 80’s is in for a treat, though. That’s what the show is for. It’s a trip down memory lane, back to the days when Jon Bon Jovi was god and mullets were socially acceptable. The bottom line is that where the plot fails to expand, the cast picks it back up again. The role of the wannabe rocker from Detroit, Drew, is the kind of role I always imagined American Idol alum Constantine Maroulis playing if he ever made the choice of going into musical theater. His performance as Drew reminded me of a longer-haired version of George and Marty McFly from Back to the Future. He’s naive and well-intentioned. He wants the girl to notice him but still wants to wail on his guitar. It works. In the American Idol days, Maroulis was the rocker who just wanted sing and be on the stage. It’s quite fitting that this is the route he’s taken. His voice is reminiscent of Journey meets Guns and Roses – he can do 80’s rock nothing but good. The cast’s strengths are two-fold: energy and vocals. Leading lady Elicia MacKenzie’s got the act of power rock down and can hold her own as a singer. Any and all duets between Maroulis and her were always well done. Rock of Ages would not have been the same if it were not for the comedic stylings of Patrick Lewallen, who played the narrator Lonny, and his on-stage bromance with club owner Dennis played by Nick Cordero. Those two have the comedic timing of a modern day Vince Vaughn and Owen Wilson pairing. Scenes with glam rocker Stacee Jaxx, played by Peter Deiwick, was like reliving a Poison video live … or catching a re-run of Bret Michaels’ Rock of Love on VH1. It all starts with a couple of kids who’ve got some dreams of making it big out on the west coast, but really, Rock of Ages is a perfect excuse to break out those acid wash jeans if you’ve still got ‘em and head bang to your favorite songs from the days when MTV still played music videos. 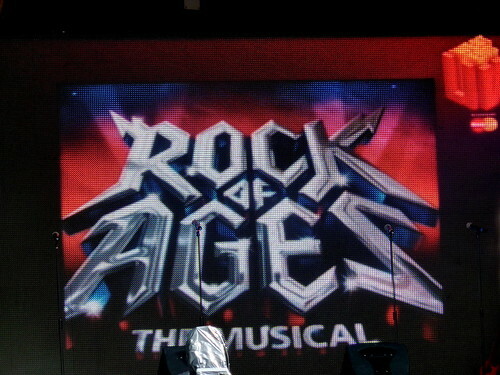 Rock of Ages has a limited run in Washington and will only be in town until July 24. Tickets are still available via National Theatre box office. I saw it he other day and it is the best thing I have seen in a long ,long time!!!! Hands down. The music was right up my ally being a child of the 80′s. I am going a gain next month when my girlfriend comes to town. Fun, fun, fun….